Worship Dynamics I will empower you to connect with your Cajon for deeper immersive worship. Through in-class supervision and group synergistic exercises, you will move from merely beating the Cajon to developing sensitivity during the highs and lows in worship encounters. You will also harness a good feel for various intensities of music and approach each song with detailed planning to create good rhythm balance for various worship settings. Our thematic journey, THE ROAD TO VICTORY, will inspire you to develop the same fortitude as the Biblical heroes who overcame struggles and obstacles in their lives. 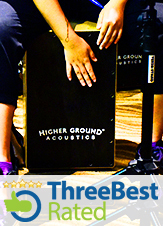 Their stories of triumph will inspire you to achieve similar victories as you play to the Cajon with Heaven’s heartbeat. Thematic Devotion: THE ROAD TO VICTORY: Receive inspiration to overcome life’s obstacles through the testament of the Biblical patriarchs. ii) Wish to relearn the fundamentals of playing hand drums especially for rhythmic feel. This will help you to develop your playing further. How different is WDI compared to Primer? The Primer module focuses on the development of proper playing postures and the understanding of music parameters. Worship Dynamics I will hone your skill to cultivate a sensitive approach to various song contexts. The goal of this module is to spark individual creativity while keeping foundations stable.